Oh my goodness, this is going to sound so bad coming from me, but I may have liked the evil guy better in this one. Well, both evil guys. I looked back at my review from way back in Jan 2012 of EMBRACE and saw how I gushed and swooned over Isaac. But when I started reading this one I realized he just wasn't doing it for me in this one. It was Reed and Caden that I found I was leaning towards. I don't remember what all Isaac did in the first book to make me fall for him, but whatever it was, he wasn't doing it in this one. Anyhow, back to the review at hand. I absolutely loved the first book and now I am head over heels for this one. HOLD TIGHT was engaging, engrossing and absolutely amazing. The storyline was addictive and I quickly and sweetly inhaled it. 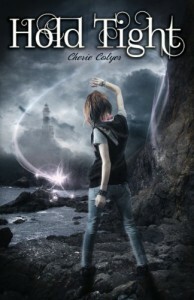 Colyer is a fantastic author who expertly brought together the world of witches and faeries in this awesome story. And the only thing I have left to say is....I NEED MORE.